The global impact of climate variability has contributed to the establishment of pilot programmes around the world that brought together climate scientists, agronomists, crop modellers and farmer representatives. Examples are the initiatives by the Queensland Government in Australia or the International Research Institute for Climate Prediction (IRI) at Colombia University, NY. The number of groups is steadily increasing and interested readers are referred to publications in special issues of Agriculture and Forest Meteorology, vol. 103 and Agricultural Systems, vols., 70 and 74 for further details. Most of these groups are partly supported by state and national government sources, and also attract considerable amounts of industry funds and farmer support. Further, the issue has been recognized by international bodies such as the WMO, who through the International START Secretariat (Global Change System for Analysis, Research and Training, co-sponsored by IGBP, IHDP and WCRP) have initiated the CLIMAG projects (Sivakumar, 2000). CLIMAG aims to utilize the growing ability to predict forthcoming climate variations to improve cropping systems management and decision-making and increase production at local, national and international scales. One of these CLIMAG projects used locations in southern India and northern Pakistan as case studies to demonstrate the utility and feasibility of combining seasonal climate forecasting with a structured, agricultural systems research approach in developing countries. With the help of the international agricultural modelling community, the project provided a means to assess the potential value of seasonal climate forecasting to agricultural producers in these regions. The project established links between research groups in Australia (APSRU; Keating et al., 2003), the International Research Institute for Climate Prediction (IRI, 2000) and partner institutions in India and Pakistan (e.g., Gadgil et al., 2002). The project team conducted agronomic and climatological systems analyses of cropping systems and provided recommendations on where additional research efforts are needed according to a general framework (Figure 2). This has lead to the development of a loose network, known as RES AGRICOLA (Latin for Farmers' business), that draws on the collective expertise of the global research community to develop resilient farming systems. 'Resilient systems' allow farmers to draw on systems resources (e.g., water, nutrients, reserves) at times of need without causing permanent damage as long as these 'debts' are 'repaid' once conditions improve. Figure 2. Outline of the concept behind the RES AGRICOLA network (adapted from Meinke et al., 2001). 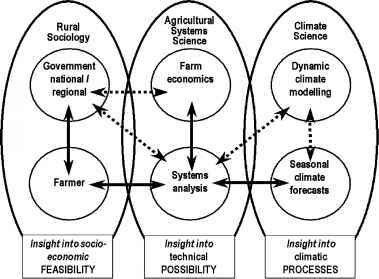 The diagram shows disciplines, relationships and linkages for effective delivery of climate information for decision-making in agriculture. Operational links are indicated by the solid arrows and show connections that have already proven useful; dashed arrows indicate areas where operational connections still need to be better developed. The basic principle of the concept (i.e., the requirement of cross-disciplinary research for effective delivery of climate forecasts) is generic and independent of the specific target discipline. 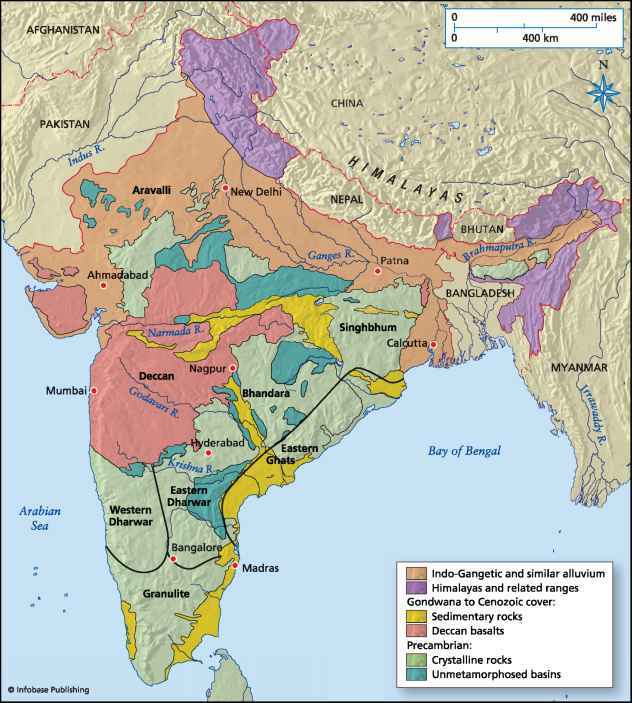 in terms of their socio-economic feasibility. RES AGRICOLA is a logical evolution of the 'end-to-end' concept proposed by Manton et al. (2000). To deliver benefits within agriculture, the concept distinguishes three discipline groups that need to interact closely, namely (i) climate sciences, (ii) agricultural systems sciences (including economics) and (iii) rural sociology (Figure 2). By operationally connecting research projects and through the establishment of international, cross-disciplinary teams, such a network will be able to convert insights gained into climatic processes via systems analysis and modelling into insights into the socio-economic feasibility of decision options. Pay-offs are more likely when a truly integrated systems approach is employed that includes decision makers and scientists across the disciplines as equal partners and guarantees that they have ownership of this process. Such a truly participatory approach ensures that the issues that are addressed are relevant to the decision maker. This process will also ensure that there is sufficient scope for decision makers to alter their behaviour or management based on the information provided. This 'ability to move' might be constrained by external factors such as current policy settings or international market forces (Meinke et al., 2001). Hansen (2002) stressed that the sustained use of such a framework requires institutional commitment and favourable policies. An example where the links shown in Figure 2 could be strengthened is in the area of connecting agricultural simulation approaches with whole farm economic analyses and policy decisions. Using a case study, Ruben et al. (2000) reviewed the available options for adapting land use systems and labour allocation for typical households in a region in Mali. They showed that consequences of climatic patterns and climate shocks could at least partially be offset by compensatory policy devices. Better-informed price policies would enable welfare-enhancing adjustments for better-endowed farm households, while poor farmers would benefit from reductions in transaction costs, particularly under dry conditions when dependency on market exchange tends to be intensified. Contrary to most expectations, vulnerable households can benefit strongly from market reform policies and thus structural adjustment programmes might provide an adequate framework for containing adverse effects from climate shocks [sic]. However, to influence policy requires operational-ising the components outlined in Figure 2 via a participatory research approach, whereby economists and policy informants also become valued members of the research team. This formal connection across disciplines must go hand-in-hand with an evolutionary strategy for climate applications, as proposed by Hansen (2002): (1) an exploratory phase (basic capacity building, gaining understanding of the system), (2) a pilot phase (co-learning through intensive interactions between researchers and decision makers) and, conditional on a successful pilot phase, (3) an operational phase that focuses on engaging, equipping and transferring ownership to those groups and institutions that will provide forecast information and support to a larger target audience on a sustained basis. The long-term aim is to achieve 'level 3' in all countries were CV impacts on agriculture. This requires a global and sustained commitment to the R&D process just outlined. We need to use the demonstrated successes where 'phase 3' is already operational (e.g., some places in Australia, US, and several demonstration projects in South Asia, South America and Africa) in order to initiate 'phase 1' activities at locations were such an infrastructure does not yet exist. So far, we have outlined the global, scientific capacity to forecast future climate patterns probabilistically and shown how this capability can be translated into socio-economically feasible management options via a systems analytical approach and participatory action research. The question remains: how can these capabilities positively influence agricultural management practice? Nelson et al. (2002) addressed this issue by introducing the notion of 'discussion support' (rather than decision support). They provided an example of a simulation-based discussion support software that acts as a key vehicle for facilitating infusion offorecasting capability into practice (sic). This demand-driven analysis tool that allows decision makers to compare options either in terms of yield or economic returns is a consequence of years of simulation-aided discussions about crop management in northeastern Australia. This created the necessary demand for such a tool as well as the capacity to implement insights gained from this tool, hence improving outcomes. It is a clear example how we can progress beyond the intensive, case-study-based, participatory research approach that by definition only reaches a small number of possible beneficiaries. However, its implementation was only possible because this region of Australia is one of the few places that has reached 'level 3' as proposed by Hansen (2002).